For over twenty years, Clap Hanz’ Everybody’s Golf series has quietly but assuredly established itself as the top dog among golf video games. Some might consider that a bit of a far-fetched claim, but it’s true - especially if you’re familiar with Hot Shots Golf, which until now was its North American alias. Admittedly it hasn’t had much competition over this time, save for the odd challenger from EA Sports. But it’s still managed to keep its place without the need for excessive licenses or Tiger Woods’ face slapped on the game box. After all, the clue to the success of its many titles is in the name - literally everybody can play them. From golf novice to pro alike, it’s been the easy pick-up-and-play nature of Everybody’s Golf that has made it such a hit. And while the series’ consistently cutesy Japanese visuals might put off some who expect seriousness to go with their simulation, make no mistake - this series’ sunshine-happy presentation hides both immersive gameplay and genuine challenge. Come for the breezy charm, stay for the struggle. It’s a formula that might sound contradictory, but it’s worked for years - as far back as the days of its first entry on the PS One, even. Until now, previous efforts have also focused themselves on a core mechanic that a lot of gamers consider to be bread and butter these days: the unlocking of new content through achievements. One-player mode always meant beating a gauntlet of CPU characters to make them playable in other modes, or to reveal new courses. For its PS4 debut though, Clap Hanz has made the wise decision to get its flagship title a little more with the times. Aside from revealing a series-first online competitive mode, Everybody’s Golf has also switched its processional ‘beat the next challenger’ style of game progression for a full-on RPG. That’s right - if grinding away on the wild frontiers of a fantasy universe wasn’t enough, you now have the ability to do so within the calmer confines of a virtual country club. 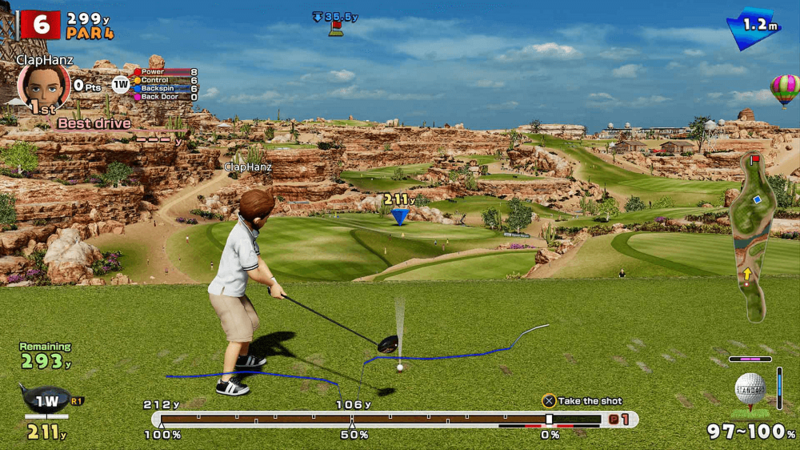 And even if the sheer variety of its unlockables can only be gained through some admittedly tedious repetition, it is ultimately the sheer pleasure and charisma of Everybody’s Golf’s gameplay that’ll have you coming back to its busywork again and again. Newcomers to this series are also bound to make visual comparisons of its current-gen debut with Nintendo titles. From the summeriness of its courses to the super-deformed characters that play on them, it could even be mistaken for a Mario Golf redux if not for a distinct lack of mushrooms and plumbers. 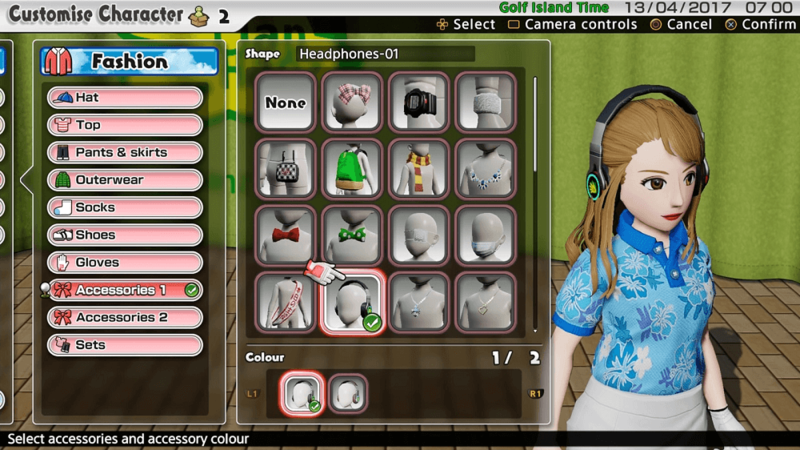 In fact, you can’t even start single-player mode without creating your own Mii-inspired creation to go golfing with. And the array of options for customization are vast - straight from the get go, there’s already a sizeable amount of threads, facial parts and victory animations available, allowing for some pretty unique creations to be made from the off. Of course, the extras you’ll go on to collect only add to this depth, leading to a wardrobe that is about par (pun intended) for this series’ goofy sense of humor. Once character creation is done, it’s off to Golf Island - the main hub from which the one-player mode’s open world adventure starts from. There is, admittedly, a mild obstacle of a tutorial to get through first (which is even more irritating if you’re already familiar with the series). But once done, you have an entire tropical island to explore, filled with a whole bunch of NPCs who either give you handy tips to boost your golfing acumen, or offer all kinds of challenges to earn yourself new goodies. It’s admittedly a bit lacking in variety at first - as well as distracting from the game’s main attraction. But getting good on the golf courses eventually opens up a whole bunch of extra activities to do on the island - swimming, fishing, even golf cart racing. But while they can be a fun excursion,  none of the modes really add much to the overall experience, save for just being another thing to unlock. It’s as though Clap Hanz simply added them all in because they felt that they had to - in hindsight, perhaps a larger number of courses could have been a better approach to padding this game with some additional depth. Nonetheless, depth is still something that can be found within the RPG-styled single player mode. 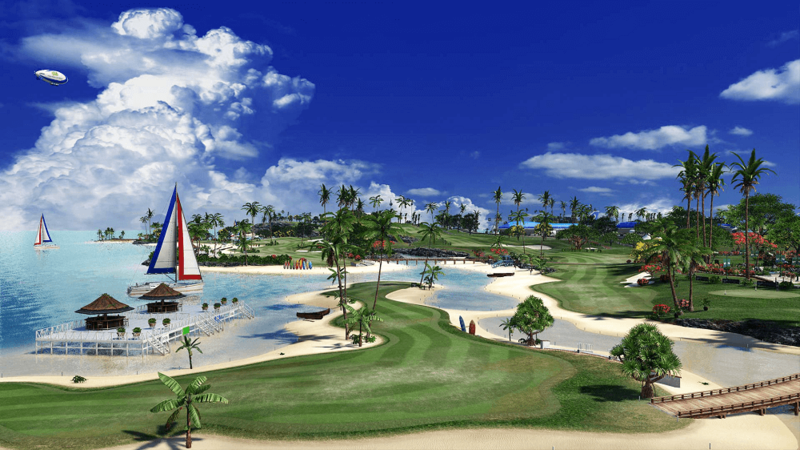 The central portion of Golf Island also includes a tournament desk, from which you can accept invites for tournaments with experience points as reward. Ranking high on the leaderboard, or even winning tournaments outright, naturally turns into more EXP - allowing you to level up certain aspects of your game (i.e power, putting, backdoor shots, etc. ), as well as your proficiency with certain clubs. It’s a fun twist on a sports genre that is in need of a bit of innovation, but it does require some patience. Frankly, the slow, steady rate at which unlocks happen can make getting them a bit of a chore. This is especially so in the early stages. The game only gives you one course to start with, and expects you to level up enough to reveal (and beat) CPU opponents to earn new links. Unfortunately, to do so, you have to win tournaments on courses you’ve already unlocked - leading to an awful lot of going back to that starting beginner course to grind your stats upward. Certainly, the tournaments do become more challenging. Hole sizes and wind speed can change drastically across each new trial, and they also vary between 9 and 18-hole outings, meaning you don’t necessarily need a full stint on the greens to get your rewards. But ultimately, it’s still bells and whistles - getting the good stuff in Everybody’s Golf will still require a fair amount of monotonous work. If trudging through tournaments against computer opposition feels tiring though, you can always take the challenge to the world itself. As of current writing, Everybody’s Golf offers two different online modes of play to test your mettle against your fellow network-connected golf nuts. There’s an Open Course mode, which allows you to free-roam any course you’ve unlocked and take part in daily tournaments, with prizes dished out for the best scores of the day. But the quirkier of the pairing is certainly Turf War - a team-based battle mode where two teams of up to 10 golfers each take part in a stroke-play oriented time-limit competition to put up a superior collective score while also racing the clock. The latter certainly offers a potentially madcap experience with the right group, while the former offers a more traditional form of bragging rights. But they both suffer from a similar issue - they feel unpopulated. 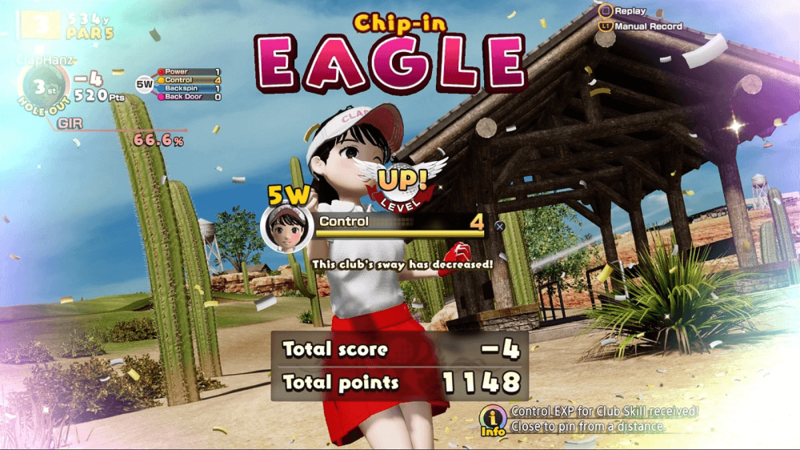 If online tourneys are anything to go by, the online world of Everybody’s Golf definitely seems pretty busy, with a submission rate of over 5,000 scores a day. But the multitude of fellow users you see online just seem to be standing around not doing much - likely because of timezones and players keeping their sessions active even when they’re not. 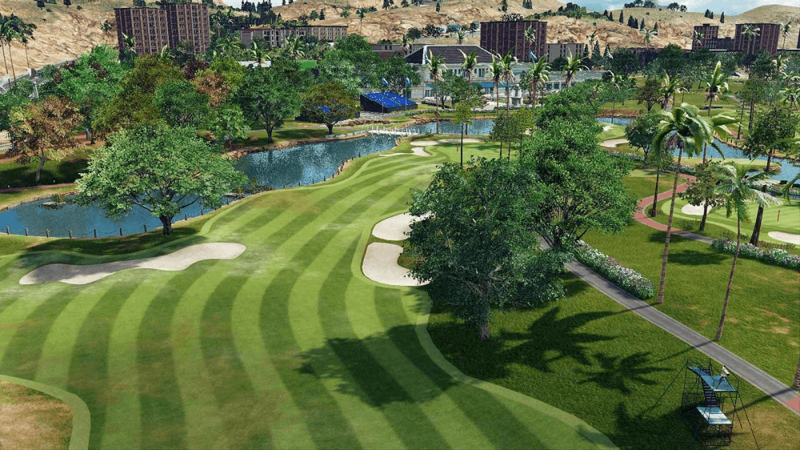 While it still offers another chance to unlock all those extra props without resorting to micro-transactions, it still adds up to feeling like a pretty disconnected experience - and definitely a far cry from the lively hub of international golfing it aspires to be. With most of its new features feeling like flawed tack-ons, it’s therefore a very good thing that the golfing of Everybody’s Golf is still an absolute blast. This is a series that has always shone when it comes down to the nitty-gritty of its putting, pitching and fairway driving. And that certainly hasn’t changed here with its PS4 outing, despite its reliance on a control system that golf games have been tied to since the 80s. After you’ve selected your tee position, you merely have to press a button three times - once to filling the power bar at the bottom of the screen, again to set its end point, and thrice when it comes back down to zero to hit the ball. Golf gamers, you already know the drill. But it’s a simple system that continues to work, and Everybody’s Golf’s additional tweaks - wind, changing effects based on ball lie, controls to add backspin, sidespin, etc. - still ensure it offers a full-rounded golfing experience. Furthermore, the physics feel incredibly tight. The struggle to get out of heavy rough or a deep bunker feels explicitly genuine, and sinking those hopeful chip-ins for an eagle is also an intensely satisfying experience. Like any great golf game, Everybody’s Golf delivers the best of itself in those moments of skilful euphoria or incompetent despair. And most importantly, it makes you feel like any great shot or mistake you make is entirely on your own merit. Rewarding gameplay aside, it’s just so bloody nice too. The successful translation of Everybody’s Golf’s jovial Japaneseness is a potent weapon in this game’s charm arsenal. It just oozes fun in every one of its facets - the voice acting, the cheerful soundtrack, the goofy animations and the vibrant, colourful visuals that are gorgeous in their own way. The game even adds its own sanguine touch to the grafting of single-player mode, by allowing you to build an entourage of characters that follow you around and cheer you on if you beat them in tournaments. Everybody’s Golf has a dizzying amount of weird and wonderful characters for you to unlock, and there’s no chance you’ll play through the game without finding a few favourites along the way - be it your fanbase, opponents or even your caddies. Everybody’s Golf for the PS4 therefore continues the series’ tradition of being an excellent golf sim, as long as you’re playing by yourself or with your friends in hotseat mode. The presence of additional open-world and online modes should be applauded as decent attempts to modernize the franchise, but they still need work. Perhaps future updates will bring improvements, but for now, it’s the enduring quality and the charm of this series that keeps it trucking in the current console generation. With its pick-up-and-play controls and silly sense of humour, Everybody’s Golf is golf with a smile on its face. And if you’re willing to be patient with its single player grind or simply want a solid golf outing, it’ll leave you smiling too. Everybody's Golf is available for purchase online at the Playstation store, and physically at all major retailers. Also, apologies if the visual stuff is a bit lacking in this write-up. My game capture device went kaput, so until I get a new one, I'll have to rely on media from official sources. Booooo.